Edwin W. Grove, a pharmacist and entrepreneur from St. Louis, Mo., built Asheville's Grove Park Inn in 1913. Grove, often considered "the father of modern Asheville," grew enamored of the city after spending summers there in an effort to relieve his chronic insomnia and bronchitis. During his frequent visits, he amassed a large amount of property in and around Asheville, including the slope and foot of Sunset Mountain in the eastern part of town. Constructed of native granite taken from Grove's surrounding properties, the inn was built in under a year, requiring a crew of 400 laborers and 20 Italian stonemasons working ten-hour days. When it opened on 12 July 1913, U.S. secretary of state William Jennings Bryan delivered the official address, aptly calling the Grove Park Inn a hotel "built for the ages." The original inn contained 156 guest rooms, a dining room, and a lobby 120 feet long and 80 feet wide. Massive fireplaces large enough to hold 12-foot logs stood at both ends of the lobby. The rock chimneys concealed elevators. While Grove provided the capital to finance the inn's construction, the vision of Fred L. Seely, Grove's son-in-law and codeveloper, gave the inn its character. An admirer of the Arts and Crafts movement, Seely sought the finest artisans of the day to furnish the inn with simple pieces that would stand the test of time in both form and function. Seely leased the inn from Grove in 1914 and managed daily operations, instituting austere policies that appealed to "tired, busy people [seeking] to get away from excitement and all annoyances and rest their nerves." The Grove Park Inn prohibited alcohol and discouraged guests from bringing small children. Guests were not permitted to run water or speak above a whisper during evening quiet hours. Seely sought to offer quality entertainment, modern conveniences, and the comforts of home. The inn originally boasted a 40-foot indoor swimming pool and shower room, a bowling alley, a billiards room, and a movie screen in the Great Hall. Vocalists, lecturers, and musicians performed almost every evening in the Great Hall. Seely's efforts attracted many famous faces to the inn, including presidents and entertainers. Although famous figures such as President Franklin D. Roosevelt; his wife, Eleanor; and writer F. Scott Fitzgerald continued to frequent the Grove Park, its financial state grew precarious. During and after World War II, the U.S. government leased the Grove Park Inn as temporary housing for various groups affected by the war. In 1942 the inn hosted Axis diplomats and their families awaiting deportation. Later that year, it housed military officers requiring rest and convalescent care. In 1944 exiled Philippine president Manuel L. Quezon arrived with his family and staff and established headquarters for his government-in-exile at the inn. By the mid-1950s, the Grove Park Inn was suffering from a lack of consistent, competent management. In 1955 Texas businessman Charles A. Sammons purchased the hotel, immediately investing $100,000 toward its first major restoration. These first changes represented the beginning of Sammons's long-term commitment to restore the Grove Park Inn as a world-class resort. In 1976 Sammons bought the Asheville Country Club and Golf Course. This purchase laid the groundwork for a historic restoration of the Main Inn and construction of the Sports Center and the Sammons and Vanderbilt wings. The $65 million effort, begun in 1982, was guided in large part by Sammons's wife, Elaine, who recognized the important heritage of the inn and encouraged architects and designers to preserve and duplicate the granite walls, oak woodwork, and Arts and Crafts furnishings. When construction ended in 1988, the Grove Park Inn boasted 140 acres of grounds, 510 guest rooms, 40 meeting rooms, 2 ballrooms, 4 restaurants, 2 swimming pools, an 18-hole golf course, 9 tennis courts, and a full-service sports center. The Grove Park Inn's excellent accommodations continue to attract guests from around the world. Bruce E. Johnson, Built for the Ages: A History of the Grove Park Inn (1991). Milton Ready, Asheville, Land of the Sky: An Illustrated History (1986). 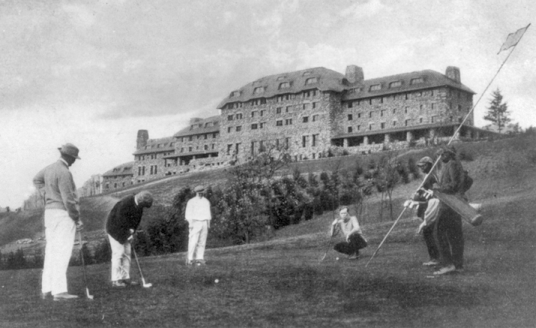 Postcard showing golfers at the Grove Park Inn, ca. 1915. North Carolina Collection, University of North Carolina at Chapel Hill Library. Grove Park Inn, Asheville N. C." Handwritten notation on back of card reads, "1910-'18." Created by John Graham Robinson, 1878-1923, ca. 1905-1915. Image Courtesy of North Carolina Collection Photographic Archives (id #: P077;1-435), Wilson Library, University of North Carolina at Chapel Hill.